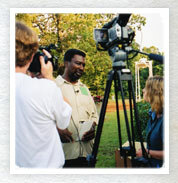 2004 marked the 40th Anniversary of Freedom Summer. In June of that year, Patti Miller had plans to return to Mississippi for the first time in 40 years. Appreciating the significance of her trip, Hawthorne Direct in Fairfield, Ia. agreed to send a camera crew to Mississippi with her. They filmed Patti's travels and reunions for a documentary which is now in production. In September of 2004, Patti also attended the 40th reunion in Oxford, Ohio (where the orientation for Freedom Summer was held in June of 1964) Posted below are photos from the Mississippi and Oxford trips and video clips from the documentary material. Video clips require the Flash 8 plugin to play. 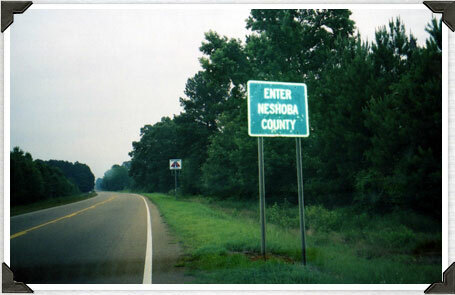 Entering Neshoba County, Mississippi, where the 3 civil rights workers were killed in the summer of 1964. 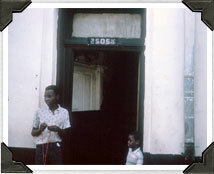 Patti being interviewed in 2004 in front of the COFO office where she worked in Meridian, MS. in 1964. 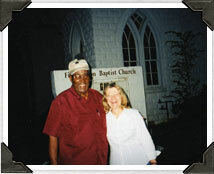 Obie Clark, Meridian native and civil rights activist, and Patti in front of First Union Baptist Church where James Chaney's funeral was held in 1964.